Momma Told Me: Go watch the TVs. 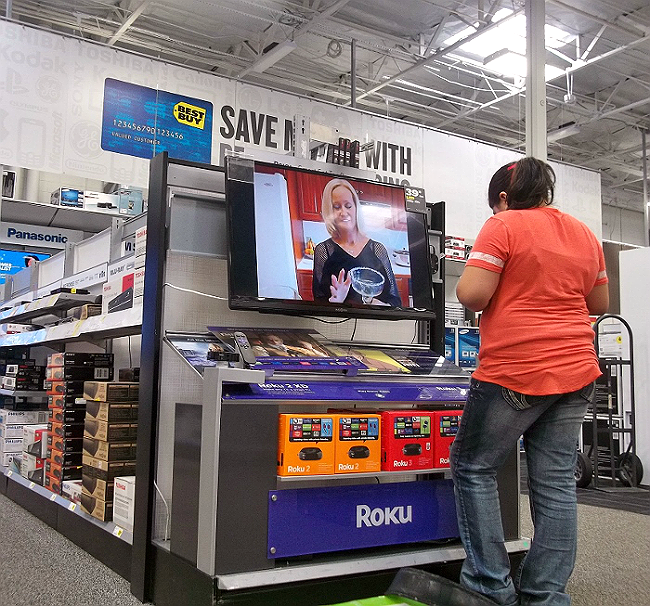 In most households shopping for electronics technology is often for women, the equivalent of men sitting outside dressing rooms in department stores. Let's face it, shopping for electronic devices has long been a male dominated category, where the women begrudgingly agrees to go along, if only to help steer the days purchases within the agreed budget. But times have come a long way since the all day excursions of my childhood. 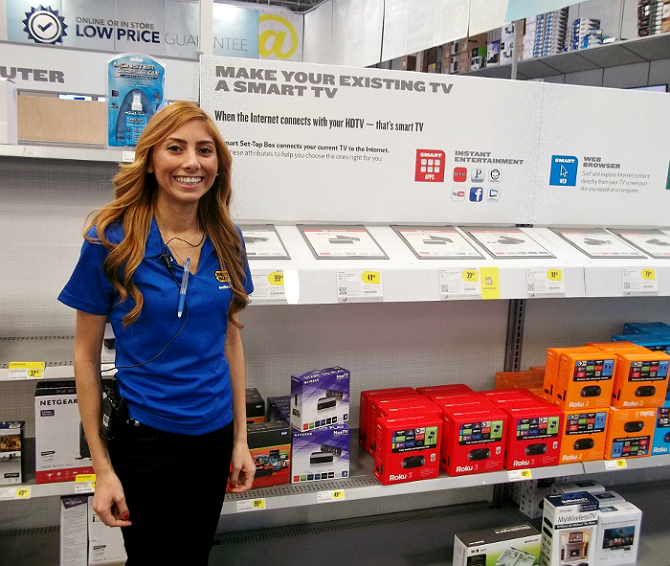 Since I was first tall enough to peer over the sales counters at our local Best Buy my family has been consulting the men and women in blue shirts for each networking, home appliance, and home theater purchase. Their Low-Price Guarantee, bundled with on the spot competitor price-matching made them an easy favorite for Momma. And, when it was time for me to fly the coop and buy gadgets of my own, I naturally continued the tradition. Don't get me wrong, I've flirted with 'others.' But I know my local yellow and blue inside and out-literally; I once spent nearly 4 days camped out in front of our local Best Buy just to be one of the first to own an XBOX 360 at launch. However, when we shop for any piece of technology, whether it's an inexpensive accessory or a new surround sound system, there's a lot more to consider than price alone. I seek intuitive guidance from knowledgeable staff, a large selection of brands and inventory, and, most importantly, hands on experience with the products that may potentially become our new 'toys.' That's why, the moment my feet hit that besparkled blue tile road, we follow it all the way back to the home theater showroom. With departments chocked full of interactive product displays, it's easy to understand why I can never just 'sneak' out to Best Buy- the family begs to come along! Recently there's been a lot of talk about 'tax time' and 'returns' in our home; which often translates to 'let's go spend our money on upgrades.' This year, our living room, and the media center was our chosen focus. We sat down as a family and composed a list of things we wish we had for our personal and family entertainment center. While Jay voted for a sound-bar, and I dreamed way outside the budget with a 4K Ultra HDTV, Sabrina hoped for more instant video and streaming options on our standard HD television. Though I had a clear focus in mind, we set out for Best Buy with an open agenda in hopes of exploring these categories and finding #OneBuyForAll. After all, the #CollectiveBias was that Best Buy had everything we were looking for, and more. As we hit the Magnolia Home Theater department our family began to unravel, a child over there, Jay calling me to follow him here, and my own self falling transfixed into a leather recliner before the most beautiful visual spectacle I'd ever beheld on a screen. As the Ultimate Showroom for home theater equipment, accessories, and upgrades, this particular section was decorated much like a modern living room, and comfortable enough to stop and 'stay a while'. I was in awe of the 4k Ultra HD picture clarity and color vibrancy, but eventually felt guilty for abandoning my party in such childlike wonder. When I once again reunited with the family I discovered Jay and Sabrina transfixed by their own personal interactive experience. 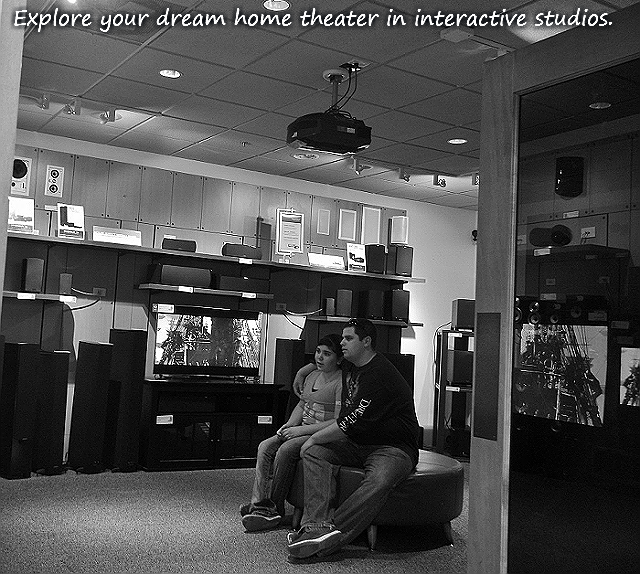 Seated in one of 2 showroom Home Theater Studios, they sat surrounded by 3 complete audio and home theater setups. Each of the projectors, speakers, and televisions inside could be directly engaged with, and even experienced in the privacy of a darkened room with closed doors. This immersive buying experience is precisely the reason we flock to the showroom every visit. We never know what new technology we'll get to try out, or what product will make our ongoing wish list. Best of all, there are employees knowledgeable about the department just outside those studio doors! 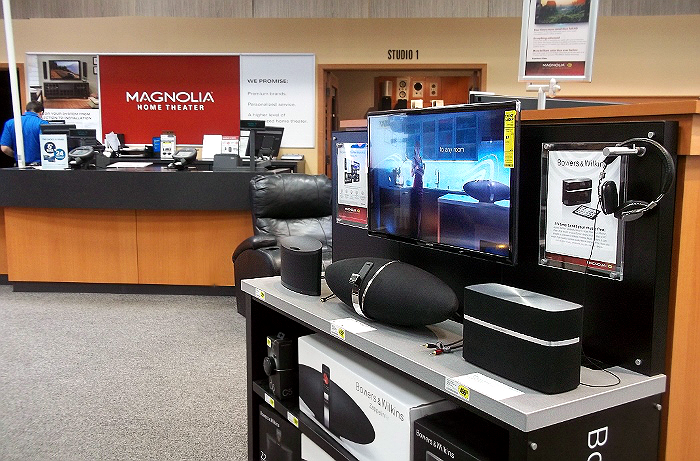 As we exited the Magnolia Home Theater department, we wove through several aisles of home theater and personal audio speakers. Here Jay got to explore some more sound bar options, as well as Bluetooth audio options for our stereo system. Every aisle was topped with vital tips about the products below, and every product was represented by a physical unit we could touch and engage with. Being able to have a hands on experience with product size, clarity, weight, and hook-ups is essential when choosing the right home theater equipment for your home. At the end of the audio department was the famed 'wall of TV's' every adult in my generation recalls as the only feature of such trips, during our own childhood. While it is quite breathtaking to see all of the televisions in synchronization along the entire back of the store; I had to often remind Sabrina this was the only thing for kids to touch and look at, when I was a kid. Of course, no sooner had I said this, than she was off tinkering with personal video cameras, as Jay explored more Smart TV innovations. Typically it drives my batty when the family wanders off in a store, but these are the trips where I happily make an exception, after all, I want to explore the showroom too! In fact, I spent quite a while turning down associate help requests, and simply enjoying the experience of immersive shopping. In my mind I set a modest 10k budget and slowly built my dream entertainment center from television to gaming center, then found myself back at the center of the store where I found Sabrina engulfed in a Roku display. At the end of the aisle, it's easy to see why this rainbow of a product station had caught her attention. Little did she know this was precisely the type of item we had come to explore in the first place. As it turns out, there are several modern solutions to the constant technological growth many buyers fear makes their home theater investments 'outdated.' One such solution is investing in an affordable, one time purchase, of a digital streaming box for your HDTV. These streaming boxes act as the 'Smart TV' brain for your modest (non-smart) existing television. They communicate with your home network via WiFi and provide an interface for you to stream online content such as movies, channels, apps, email, and more, directly to your main television screen. There, however, are many brands and models, so, this time, I happily accepted the offer of assistance from a passing employee. We soon learned about the different streaming channels available within each brand, parental control options, and web browsing compatibility. I was especially interested to hear the associate mention additional services offered at our location, including recycling and installation. In the past, we have often streamed our media content from gaming systems we rarely use. Not only does this frustrate me, when it comes to unplugging and switching inputs, but I hate having to surf through several layers of gaming profiles just to stream my content. However those days are long over with the Roku systems we've now upgraded our home televisions with. Complete with it's own remote, and quick channel buttons, our Roku allows us to view our Netflix, Amazon Prime, Hulu Plus, and even hard drive content, instantly on our home theater TV. Of course, now we'll need to begin upgrading our home theater sound system, and for that, we've already begun browsing the Home Theater Buying Guide- looks like we'll be back at the Ultimate Showroom in no time! 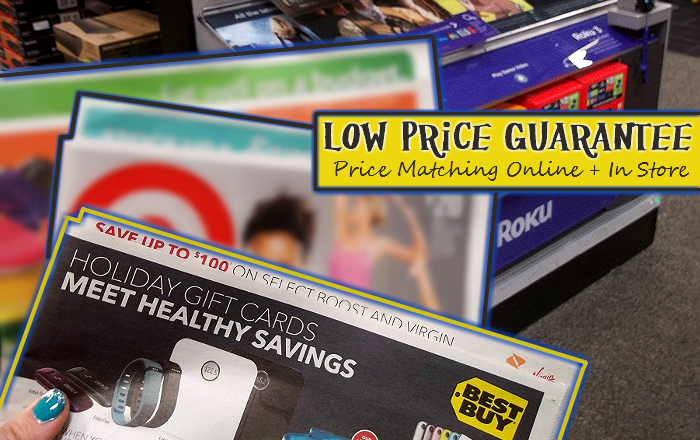 And, in the interim, I'll be keeping an eye on our favorite products with Best Buy's Low-Price Guarantee. 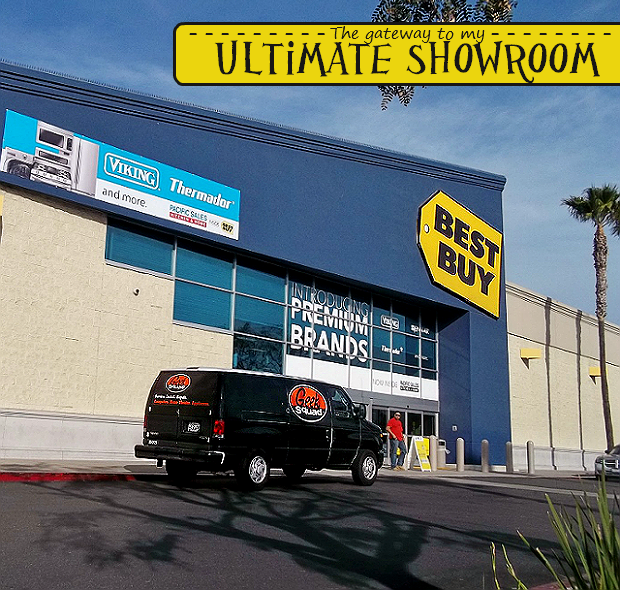 What Daughter Says: Shopping for your ultimate home theater is now an experience the whole family will love, with the hands on Ultimate Showroom, at Best Buy. This is something the hubby and I are just looking into - we want to ditch the satellite but need some expertise on the best way to move forward. I think a trip to Best Buy is in order. 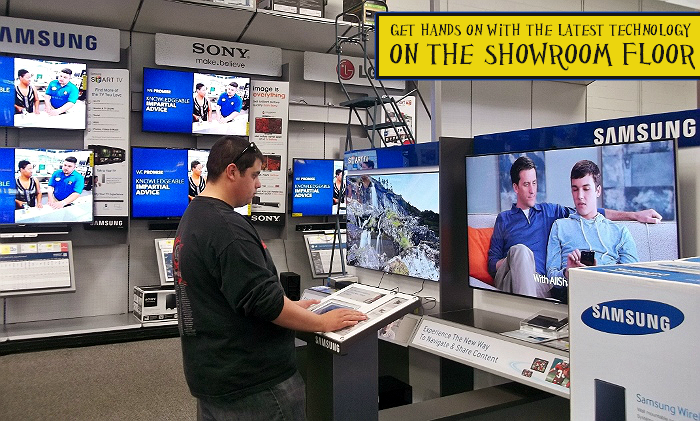 I love that Best Buy gives you a great opportunity to try out all of the great technology. We love Roku at our house. Enjoy! We just got Roku in our house last month and love it! Interesting. I love Best Buy ... it's funny that you compare tech shopping and women begrudgingly going along (at least, how it used to be) to men sitting outside dressing rooms too! I am so not an electronics person-- I can't believe you were outside a best buy for 4days for an Xbox :) But I will admit, if I ever do need electronics I go to best buy. I like them alot and it makes the shopping process much easier for me. We need a new TV so bad. We have a very distracting line through ours currently, and we definitely need an entertainment system. I am so tired of holding onto the remote control while watching movies so I can adjust the volume of whatever I'm watching. We can't hear people talking so we turn it up to 50, then all of a sudden there's a wicked loud gun shot out of nowhere that scares the crap out of us! I think having surround sound would help a lot with that. Looks like Best Buy has some great choices! I have had a Roku for years now and still love it. OK, so are you going to get a soundbar when tax time rolls around? That's what I'd like to surprise my husband with for sure. We are huge Roku fans at our house! 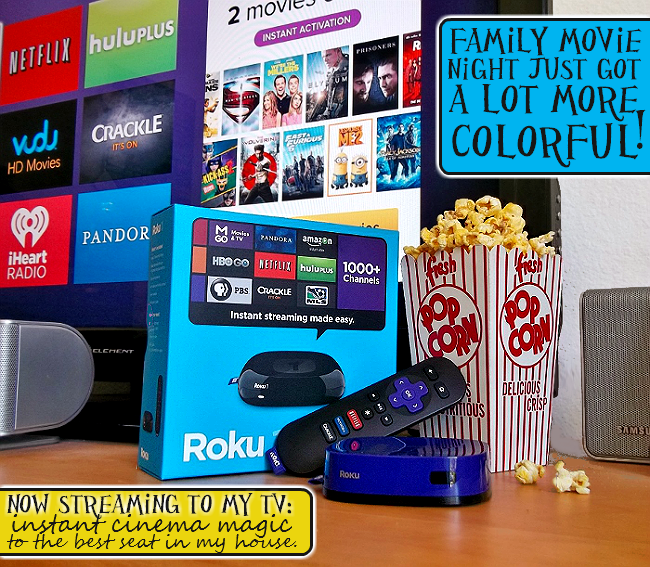 They definitely do make movie night more colorful, and for a small fraction of the cost of cable or satellite! Best Buy is awesome. From the description it seems like Roku is really similar to Chromecast. I wasn't familiar with it before, but it seems pretty awesome. Thanks. I love Best Buy!!! I loved reading your review and finding another woman who loves Best Buy! Oh, yeah... I am such a dork at electronic shopping. I basically go for the new and shiny. We had a great TV, but old Roku, no Blu-Ray, etc... so getting a chromecast and Xbox One (better quality Roku, picture and Blu-Ray capable) completely transformed our living space. I do love LOVE checking out the Best Buy showroom. Gives me all sorts of things to daydream about. Best Buy is my go to store,they always have the items in stock and the employees are very knowledgeable and FRIENDLY!! I love shopping at Best Buy. They have such a great variety of appliances and electronics. My husband would be camped out in the Home Theater department, too! Looks like a productive shopping trip! Wow! It's great that they let you try out the products! I'm thinking a trip to Best Buy is in order! I wouldn't mind trying out all of these centers - I am most interested in seeing what the Roku display is all about. They have such a great set up for watching, playing, and comparing electronics. It's even better in person! 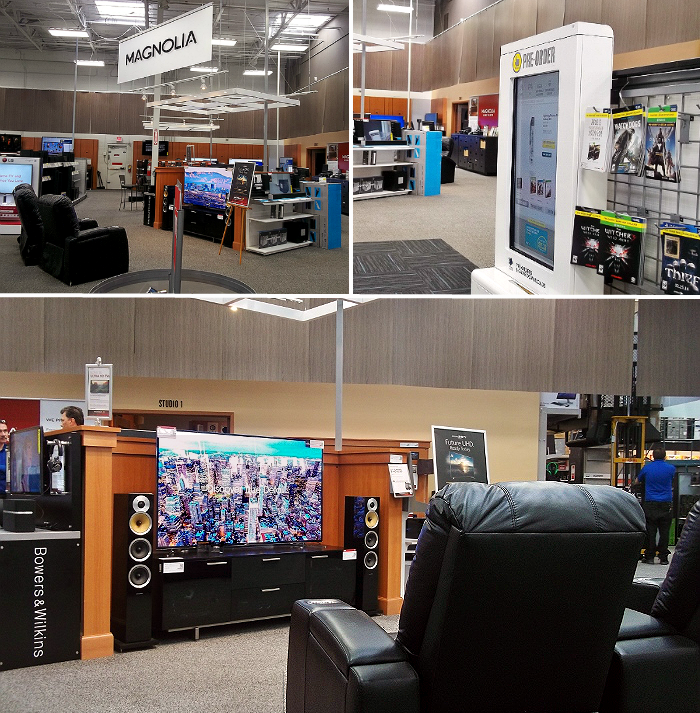 It is easy to get lost in Best Buy, especially around the home theater section. We could use a new TV. Maybe if we get a descent tax return. We always go to Best Buy to checkout the newest phones and tablets before we buy. Can't live without their service plans either! I love Best Buy and I am finding myself turning to them more and more! I could spend hours at Best Buy. Liked reading about your experience. I used to love looking at the TV's when I went to the store when I was a kid. I don't think I have been to Best Buy in years. Best Buy is a lot of fun for checking out technical goodies. It sounds like you got the whole family involved which is great!